After spending the majority of our week in Santa Fe at the RV park (Santa Fe Skies, which we really liked considering we usually are not big fans of RV parks) working, cleaning, doing projects around the house, and watching goats mow the lawn, we finally got out for a few days to explore the town. 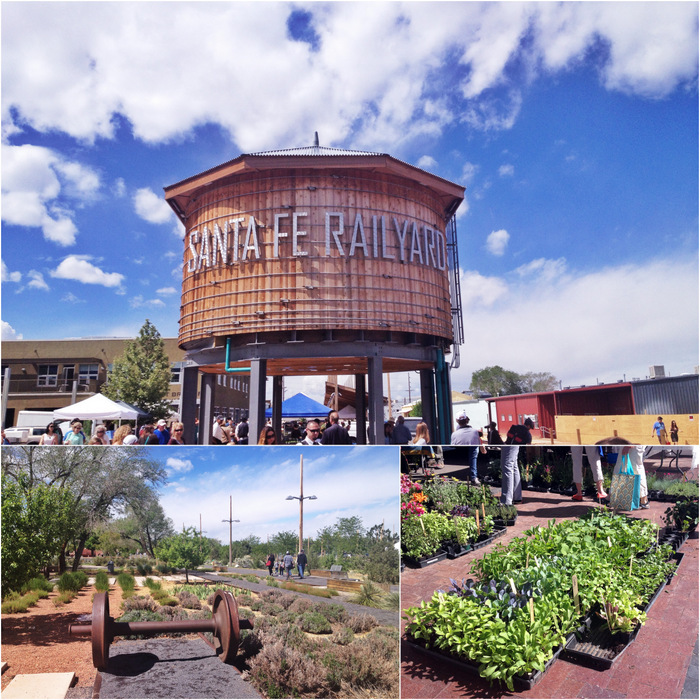 It didn’t take long for us to conclude that Santa Fe is a really cool town. It’s the perfect small city/large town size, offers up lots of outdoor activities, is full of culture and history, has a thriving food scene, and manages to give off both a tourist and local friendly vibe. During our short visit we really only managed to scratch the surface of possible activities, which means that once again, we are adding to our list of places where we want to return. Here’s a quick overview of the things we did, and the things we hope to do more of the next time around. Santa Fe has an impressive 15 museums, ranging from the famous Georgia O’Keeffe Museum to the lesser known House of Natural Oddities and Bug Museum. We neither had the time nor desire to visit 15 museums in one week, so we chose just one. The New Mexico History Museum turned out to be the perfect place to learn all about the state that we’ve recently spent so much time exploring. Covering 400 years of history, this large museum offers up a remarkable array of exhibits and artifacts. We both agreed that this was by far the best state history museum we’ve ever encountered. Tickets to the museum ($9/each, or free on Fridays from 5-9 May through October) also include entry to the Palace of the Governors Museum. This historic building dates back to 1610 and it proudly holds the place as the oldest continuously occupied public building in the country. 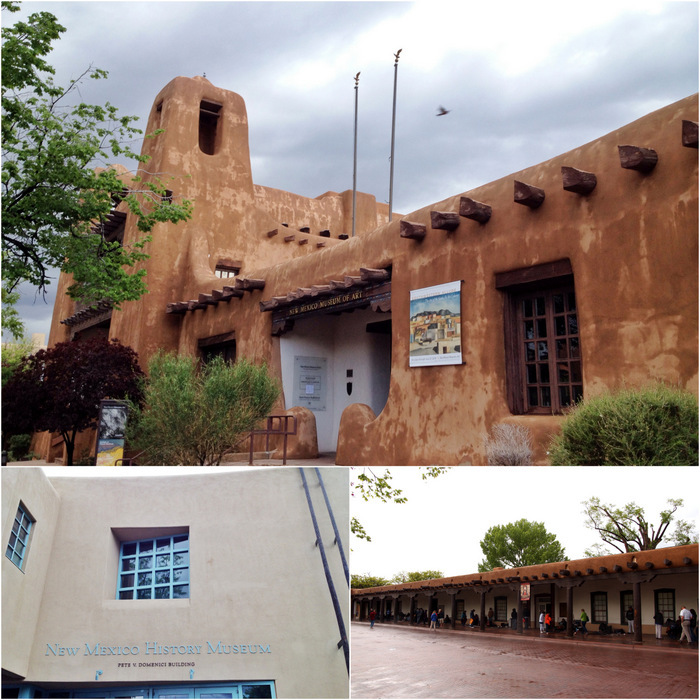 If the history museum and Palace of the Governors are any indiction of the quality of the museums in Santa Fe, then we definitely need to visit a few more the next time around. 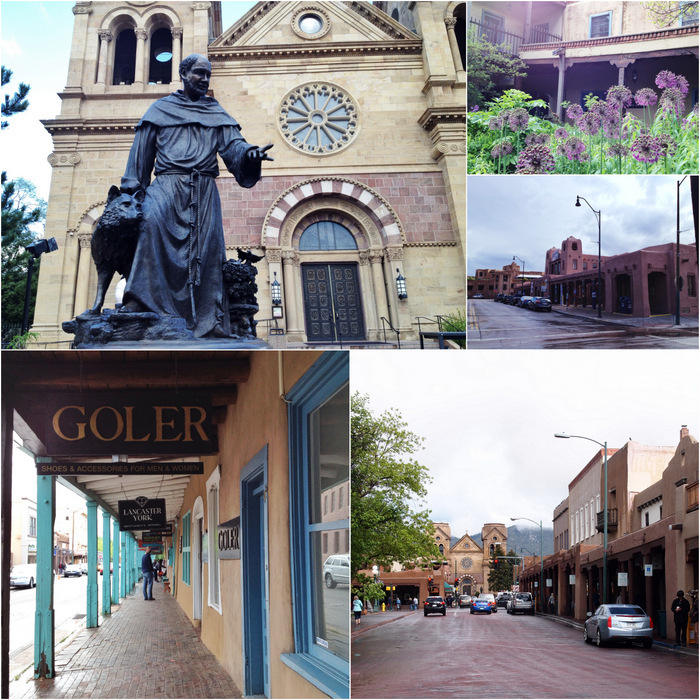 Downtown Santa Fe has a few great areas for exploring on foot. The most well known is The Plaza. 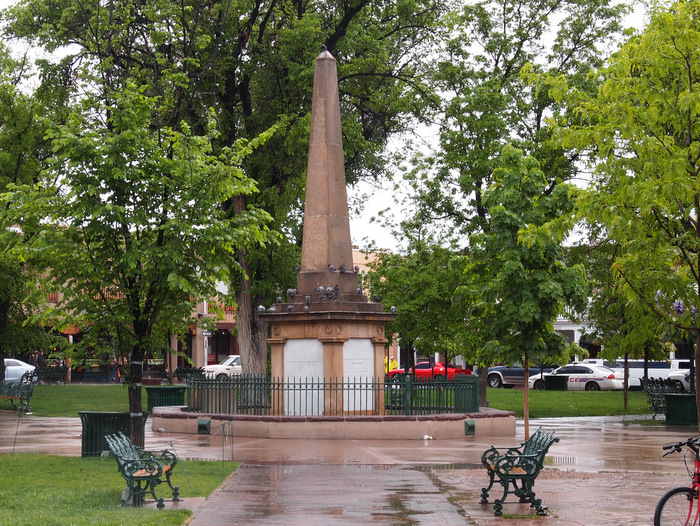 Listed as a national historic landmark, The Plaza resembles a traditional Spanish-American Colonial city with structures built in Pueblo, Spanish & Territorial styles. The original plaza was a fort surrounded by residences, a prison, a chapel, barracks, and the Place of the Governor. These days the fort has been replaced by a small grassy park, and while some of the historical buildings remain, including the Place of the Governors, and the Cathedral Basilica of Saint Francis of Assisi, most of the buildings in the Plaza house shops, restaurants, galleries and hotels. We’re not big shoppers so we barely glanced at the high-end shops full of turquoise jewelry & cowboy hats, strolled right past the Native American goods displayed on the street, and merely peeked in the windows of the fancy art galleries. We did enjoy walking around and taking in the sites though, despite the few rain drops that we had to dodge along the way. The Railyard is more modern version of the plaza. It also offers up a park, shops, and restaurants all in an extremely pedestrian friendly layout. But unlike the Plaza, which is geared towards tourists, the Railyard seems to be vying for the patronage of locals and tourists alike. In addition to stores and restaurants there’s also a really great playground, a large garden and picnic area, a teen center and music venue, performance space, and room for special events and gatherings. We visited on Saturday morning for the weekly farmers market. Despite the fact that it’s still kind of early in the growing season we found the market bustling with people and vendors. There was an impressive variety of greens, plant starts, breads, cheeses, herbs, oils & vinegars and crafts. I thought the prices were a bit higher then most farmers markets we’ve been to, but the quality seemed really good, and we ended up with a loaf of Ciabatta bread and a jar of local basil chévre. We also enjoyed a stroll through the park and gardens. 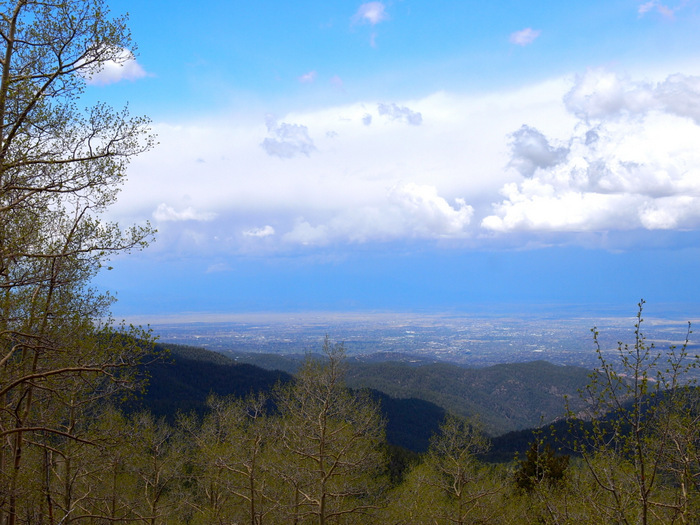 Santa Fe is filled with great opportunities for hiking and biking. I am sad to say that our schedule, combined with some rainy weather, prevented us from enjoying any of these opportunities, but we did manage to make a drive up into the mountains. The Sange De Cristo mountains lie on the east side of town and provide residents and visitors alike with tons of hiking, biking, camping and even skiing. 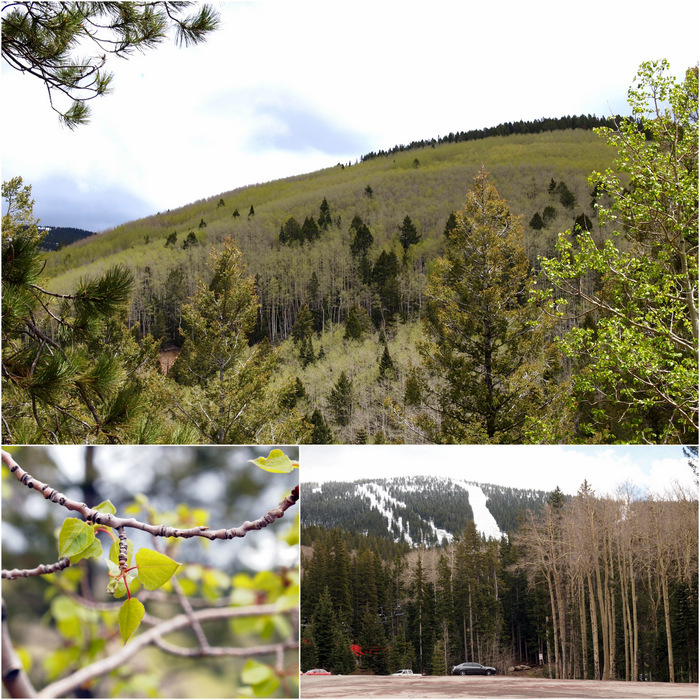 We drove all the way up to the ski area where we found some trials with plenty of snow and aspen trees just beginning to leaf out. Along the way we stopped to check out both the Black Canyon National Forest Campground and Hyde Memorial State Park. They seemed fairly nice, but there is not even a tiny bit of cell service in the mountains, so they’re not an option for us. We did pass by lots of hiking trails though, and hope that when we come back through here in the fall we can make time to stop and hike around a bit. Santa Fe is known for it’s vibrant local food scene. While we couldn’t seen to find the time for a hike or bike ride, we somehow managed to find time to eat out at four different restaurants. We started with dinner out at The Pantry with our friend Cassie. This small, diner-style restaurant offers up some solidly good food with a Mexican kick. Later in the week we had another night out with Cassie. 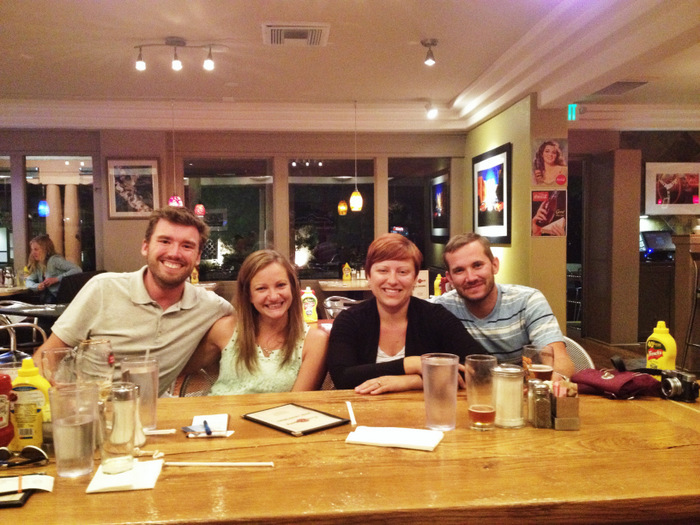 This time her husband Kris joined us and we indulged in some seriously good pizza at Pizza Centro. Cassie and Kris are former RVers turned Santa Fe locals. We first met them in Oregon way back in the fall of 2012. Throughout that fall and winter we spent quiet a bit of time with them in different spots around the southwest before parting ways. They ended their travels over a year ago and happily settled into a new life in Santa Fe. We haven’t seen them in a long time and it was so nice to catch up. Can’t wait to see you two again! We also tried out an iconic Santa Fe eatery called the Santa Fe Bite (formerly Bobcat Bites). We ended up at the Bite with a group of two other Airstreamer couples, Kristen & Jason and Julie & Anthony. It was our first time meeting both of these couples, and as usually happens when RVers converge we formed an instant connection. The four of them have been to lots of places in the middle and southern part of the country that we haven’t yet visited, and we eagerly soaked up information on the good, and bad, places to go. We also had a pretty in depth conversation about composting toilets (Kristen & Jason have one), grey water, and solar panels. You might think that talking about toilets over dinner with people you just met would be awkward, but since we’re all pretty used to dealing with our own crap, it was more enlightening than disgusting. Santa fe also has a few good breweries in town. We missed out on the Second Street Brewery, but did end up making two visits to the Santa Fe Brewing Co. It was only a few minutes drive from the RV park, which means we had to go at least once. They offer up a happy hour with $3 pints (the first time we went they had $2 pints. Not sure why & we didn’t question it), along with a casual outdoor seating area and upstairs game room. The second time we met up with our Airstreamer pals for some pre-dinner beverages on the outdoor patio. Even though it’s located off the beaten path at the very southern edge of town, it appears to be a pretty popular place, especially among the local crowd. Finally, I have to mention a tiny little restaurant that we discovered on our last night in town. It’s called Dr. Field Goods. They serve up a unique menu of locally inspired, and sourced, dishes. Even though the menu is small we both had a hard time deciding because so many of the options sounded amazing. Tim ended up with a crispy pepperoni pizza and I had the sandwich special which was a Croque Madame (thinly sliced ham and cheese on toasted bread smothered in béchamel sauce with a fried egg on top) with a New Mexican twist of what else…green chili in the béchamel sauce. Yes, it was as rich and delicious as it sounds. They also have a yummy beverage selection including homemade sodas. I tried and loved the fresh ginger and lemon soda. We ended the night with a glass of delicious rich Chocolate Milk Stout. I guess we were too involved in our food to remember to take any photos, but trust me when I say this place is a winner. It was my favorite of all the places we ate in Santa Fe, and the first I would return to the next time we’re in town. Speaking of returning. We do have plans to return to Santa Fe at the beginning of October on our way to the Balloon Festival in Albuquerque. Chances are it will be a shorter stay, but we’ve heard that fall is a great time to visit, and we have high hopes for another great stay in what we’ve decided is a really cool town. Good to know! Now I am looking forward to returning even more. Love the ideas of finding some fresh roasted chilies. And the distillery sounds wonderful! Will definitely put it on the list for next time. We haven’t been to Santa Fe in years so this was a great tour for me. Love this city and New Mexico in general. Even though you didn’t get the chance to experience many of the trails, looks like you had some amazing visits with friends. I would love to go to the Albuquerque Balloon Festival. I have been to several in Scottsdale, AZ and Monument Vally but Albuquerque is reputed to be the best. We agree that New Mexico in general is a pretty amazing place. Santa Fe seems to be one of those towns that has it all and we can’t wait to go back and experience it again. We’re very excited about the Balloon Festival. It’s been on my bucket list forever! Hi guys! 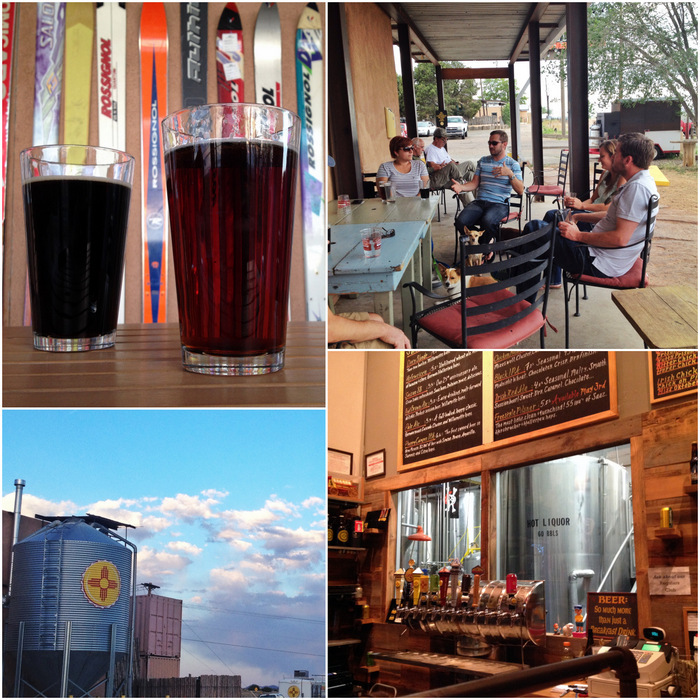 We loved Santa Fe too – especially the Santa Fe Brewery. Stayed at the same RV park two different times. 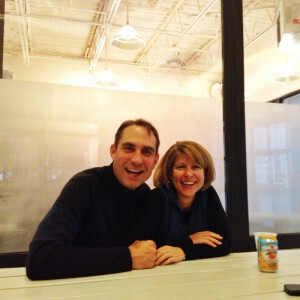 Next time check out Mu Du Noodles – it’s pretty fabulous! The only thing that could have made the RV park & brewery combo better is if they were in walking distance of each other! Next time we’ll be sure to check out the noodle place. Sounds delicious! Ok, this is sounding repetitive but we love Santa Fe. Btw, we are going to the Balloon Fest too, we’d love to get together while we’re there. We’ll definitely have to get together at the ballon fest!